Enterovirus 71(EV71) causes recurring outbreaks of hand, foot and mouth disease and encephalitis leading to complications or death in young children. More effective antiviral drugs are needed to prevent or reduce EV71-related disease and complications. 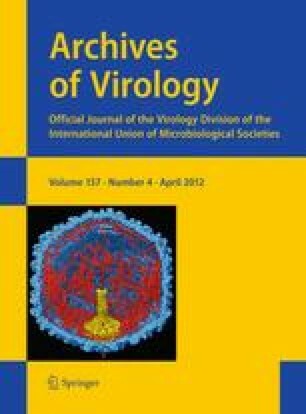 However, there are no standard models currently in use to evaluate activity against EV71 infection both in vitro and in vivo. In this study, the activity of ribavirin and pleconaril against EV71 infection was evaluated in two models. An in vitro EV71 infection model was developed in RD cells, and an in vivo EV71 infection model was applied. Ribavirin and pleconaril effectively increased the viability of infected cells. Pleconaril reduced the morbidity and mortality of one-day-old infected mice, but ribavirin did not protect the infected mice. In all, the results demonstrated that infected cells and infected mice can be used to evaluate antiviral activity of ribavirin and pleconaril against EV71 infection in vitro and in vivo. G. Zhang and F. Zhou contributed equally to this work. This work was supported by the National Science and Technology Major Project of China (NO.2009zx09103-005), Professor Zhiyang Shi, who kindly provided virus from the Key Lab of Enteric Pathogenic Microbiology of the Chinese Ministry of Health, and Qingxian Cao and Yinlai Deng from the Jiangsu Wu Zhong Group.